Entrepreneurship is an important part of Atlantic Canada's economic growth and the University of New Brunswick has worked hard to create countless opportunities for students to pursue their entrepreneurial dreams. Many of New Brunswick's most creative ideas have emerged from the university environment and the 2013 Student Pitch Competition, open to all students, hopes to vet even more of these great ideas. Hosted by UNB's Dr. J. Herbert Smith Centre, along with generous support from sponsors province-wide, UNB students will pitch their business ideas on Thursday, March 28. Registration for competitors and guests opens at 12:00 p.m. This year, 25 teams of students from a variety of programs at UNB will deliver their innovative business idea or product in a three-minute pitch to a panel of judges, members of the local business community and peers, followed by a four-minute question period. 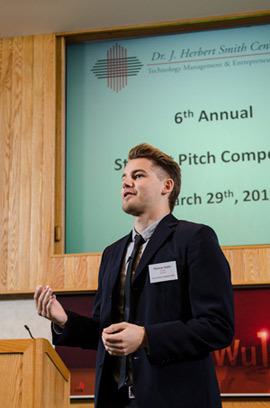 Previous Student Pitch Competitions have assisted in launching businesses such as SmartSkin, SceneSharp, and NovelBoard, in close partnership with the International Business and Entrepreneurship Centre's Activator program. Dr. Dhirendra Shukla, Chair of the Dr. J. Herbert Smith Centre says, "The continuous success of UNB at the recent NBIF Breakthru is a huge endorsement of UNB executing on its strategic objective to provide a transformative student experience and also foster a culture of innovation and entrepreneurship throughout the university." This experience presents students with an opportunity to win cash prizes, acquire excellent advice from judges and network with sponsors and local entrepreneurs. The event, along with various others hosted by faculties across UNB throughout the year, encourages a more innovative environment which challenges students to think creatively and builds confidence for them to move forward to grow their ideas. The pitch competition is open to the public.